We all know “major sins” like adultery, murder, and stealing are clearly prohibited in the Bible and most Christians steer clear of these kinds of offenses. Yet, while avoiding these “major sins”, we often lose sight of our need to deal with our own more subtle sins. In fact, we often tolerate these more “acceptable sins” in ourselves thinking them to be more minor offenses and, thus, less serious. 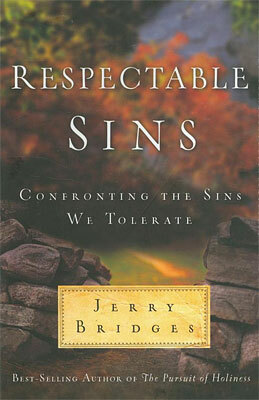 However, in his book Respectable Sins, Jerry Bridges shows that these sins are equally offensive to God and require the same zeal to eradicate as the “major sins” in our pursuit of holiness. Bridges graciously but clearly confronts such sins as jealousy, anxiety, impatience, anger, pride, unthankfulness, envy, sins of the tongue, and judgementalism. In his admonitions, he offers a message of hope in the profound mercy of the Gospel and the transforming grace of God as the means to overcome our subtle sins. If you have been tolerating some of these “respectable sins,” read Bridges book to discover the liberating power of the Gospel to free you from them!